BUENOS AIRES—President Donald Trump and Chinese leader Xi Jinping on Dec. 1 held a bilateral dinner meeting at the end of the G20 summit in Argentina. Before the start of the meeting, Trump told reporters that the two leaders would discuss a range of issues, including trade. He said he looked forward to the dinner and discussion. “The relationship is very special—the relationship that I have with President Xi,” he said. “China and the United States are two important countries with major influence in the world and shoulder important responsibilities for international peace and prosperity,” he said. Both sides would exchange ideas on issues of mutual interest and draft a future for the China-U.S. relationship, Xi added. 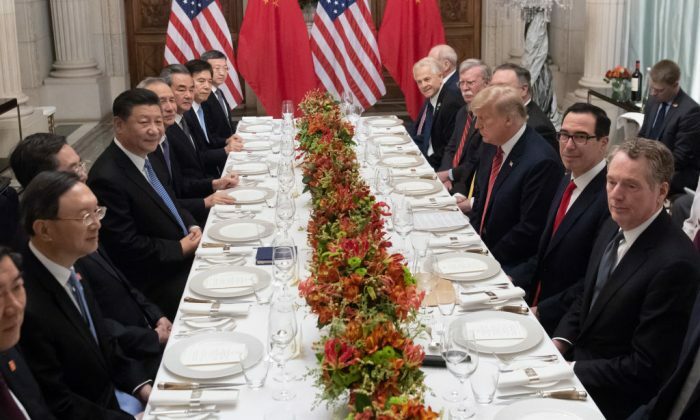 Trump and Xi were seated across from each other in the middle of the table, surrounded by their respective delegations. The U.S. delegation included Secretary of State Mike Pompeo, Secretary of Treasury Steven Mnuchin, Chief of Staff John Kelly, U.S. Trade Representative Robert Lighthizer, National Security Adviser John Bolton, Assistant to the President and Senior Adviser Jared Kushner, Assistant to the President for Trade and Manufacturing Policy Peter Navarro, and Assistant to the President for Economic Policy Larry Kudlow. Tensions between Washington and Beijing have increased in recent weeks ahead of the high-stakes meeting between Trump and Xi. The Trump administration has taken a tougher tone against Beijing, stating that the United States is prepared to more than double its tariffs on Chinese goods if they fail to reach a deal. Trump and his officials signaled that they would not back down unless China fundamentally changed its attitude. Trump had previously said that 142 concessions offered by China were “not acceptable.” The commitments by the communist regime fell short of the key structural reforms that Washington has been demanding, such as ending intellectual property theft and forced technology transfer. To force China to end its unfair practices, the United States has imposed tariffs on nearly $250 billion worth of Chinese goods this year and the levies will be raised to 25 percent from 10 percent on Jan. 1, 2019. Trump said earlier that they are ready to slap additional tariffs on Chinese goods worth $267 billion. Investors have been holding their breath about the meeting between Trump and Xi as any consensus over trade can bring some relief to global markets. The state of the Chinese economy has been putting pressure on Xi, as economic growth has slowed this year, battering its stock market. Troubles will deepen in China if the trade tensions continue next year, according to experts. Deep divisions between the United States and China surfaced last month at the Asia-Pacific Economic Cooperation summit in Papua New Guinea. As a result, leaders who attended the summit failed to agree on a joint communique for the first time in 25 years.